Li Lian Jie (born April 26, 1963), better known by his stage name Jet Li, is a Chinese martial artist, actor, film producer, wushu champion, and international film star who was born in Beijing, and has taken up Singapore citizenship. After three years of intensive training with Wu Bin, Li won his first national championship for the Beijing Wushu Team. After retiring from wushu at age 17, he went on to win great acclaim in China as an actor making his debut with the film Shaolin Temple (1982). He went on to star in many critically acclaimed martial arts epic films, most notably the Once Upon A Time In China series, in which he portrayed folk hero Wong Fei-hung. Li's first role in a Hollywood film was as a villain in Lethal Weapon 4 (1998), but his first Hollywood film leading role was in Romeo Must Die (2000). He has gone on to star in many Hollywood action films, most recently co-starring in The Expendables (2010) with Sylvester Stallone, in The Forbidden Kingdom (2008) with Jackie Chan, and as the title character villain in The Mummy: Tomb Of The Dragon Emperor (2008) opposite Brendan Fraser. He also appeared in the Hong Kong film Ocean Heaven (2010), directed and written by Xiao Lu Xue. The first is the physical contact - use your physical star, stop your enemy or kill your enemy. The second level is use your knowledge and language and strategy to stop the enemy before the physical contact. The third level is to show your honor, belief, your love to the enemy, turn them to become your friend. So those are the three levels I try to show in this film," Jet Li explains. "So everything I want to say about wushu’s, true meaning about wushu or martial art - in this film I have said, so in the future I have nothing to say, and that’s why I said this is the last one." Jet Li says that this true-life character remains the closest to himself, a character that he’s been dying to play for the past decade. "I think that first of all where martial art is our life, even 100 years difference, we have a same belief and philosophy and so I put them together to make this movie." Shaolin Temple is the single most influential feature film in Shaolin history. This film served as the primary economic stimulus that aided in the restoration of the Shaolin Temple. 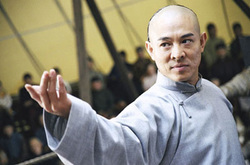 In addition, Shaolin Temple is responsible for launching Jet Li's career. Although people continue to debate which part of the film is most exciting, many people can agree that this scene is perhaps the most famous in Shaolin movie history.